Madison Avenue isn’t a street known for its dedication to straightforward communication. The only place where more concentrated brain power is put to use conjuring up language to confuse and confound America is Washington D.C. From beer to cars to travel services, some of the most bizarre methods imaginable are put to use to convince you to pick one product over the other. Amazingly, now and then the truth slips in. Miller Light had an advertising campaign. The main selling point was a comparison to Bud Light, wherein the narrator proclaims that in taste tests, Miller Light has more taste than Bud Light. At that point a tiny little piece of text appears, invisible to all who did not spring for HD, to inform us that the comparison was based on amount of flavor, not quality. Miller Light tastes MORE, not better. You know something? Vomit tastes more than water, but guess which one I’m going to pour into my glass. I saw another commercial where they showed a Hummer being assembled. As the half assembled chassis of the behemoth was being maneuvered down an assembly line by a conveyor belt, the teeny little text comes back, informing us this time that this is indeed a professional driver on a closed course. NO IT ISN’T! It is a MACHINE! The very next scene is a guy driving up a sixty degree incline. The text is gone. Apparently there was just some average Joe out on highway twelve. So go right ahead and start slinging mud and scaling buildings in your car, just so long as you don’t go all willie nilly, joyriding on the the assembly line. Along the same lines, what do you think about the commercials for cars that never show any actual driving? Gee, I guess if I want a car that can turn into a demon, I’ll get a Honda. If I want to drive through a volcano, I’ve got to get me one of those Jeep Grand Cherokees. Now, if only I could find a car that will dance with other cars or maybe one that can pull the moon out of the sky. Oh, good. Ford makes one. Not all commercials are full of lies, half truths, or weasel words. Travelocity used to have a commercial that finally said what every single piece of advertising since the dawn of time has wanted to say. Don’t think! “But what about my job?” Don’t think! Please, don’t use your mind, just buy our product. I admire that degree of honesty from a company, even if the words are delivered by poorly animated pink and blue cartoon characters. Before we wind this article up, let me drop a little education on you. Sometimes even very simple language can be deceiving. For example. Best. This is a pretty common word. If you hear best in a commercial, surely it is a very good product. Nope. It turns out better is better than best. See, if there are fifty products and they all do roughly as well as each other, and nothing does any better, then all fifty are the best. Meanwhile, if there are 49 that are equal and one that is better, the better one can say so. “Better than all of the rest” is technically the best claim, while “Best” is almost definitively average. If the very simplest superlative in the language can be made to mean its opposite without technically lying, what chance do we have of actually being able to trust what we hear? P.S. 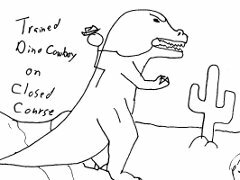 Those of you who clicked through after seeing the Dino-Cowboy doodle on the main page may be disappointed. See, it is an article about how people lie in ads. Get it?